Consulting is often a way to start a bright career in other industries: it is the perfect training ground for brilliant new graduates with top academic profiles. You work with some of the most capable people in business. The skills you develop are highly sought-after in the job market. However, due to the high pressure on performance and the gruelling working hours, many people leave consulting after a few years. Often, they’re in search of other career paths where they can put their hard-earned skills to practice. Which are the best career paths for alumni? Based on over 20,000 applications made on the movemeon platform, these are the top industries ex-consultants move to. Big corporates are always looking for alumni. Experience in consulting will usually translate into you entering the company at a higher level compared with other people with your years of professional, but not consulting experience. The most typical function for consulting alumni is obviously strategy. But according to our analysis of people hired trough movemeon, we can see that there are also other interesting functions for an ex-consultant, such as operations and product management. The world of start-ups is an interesting realm for consulting alumni. Compared to consulting firms, they have a very different environment and approach to work. But the skills acquired in years of projects, data analysis and problem-solving make consultants perfect candidates for founding new start-ups or managing existing ones. This article offers some useful information for consultants that want to start a career in a start-up. 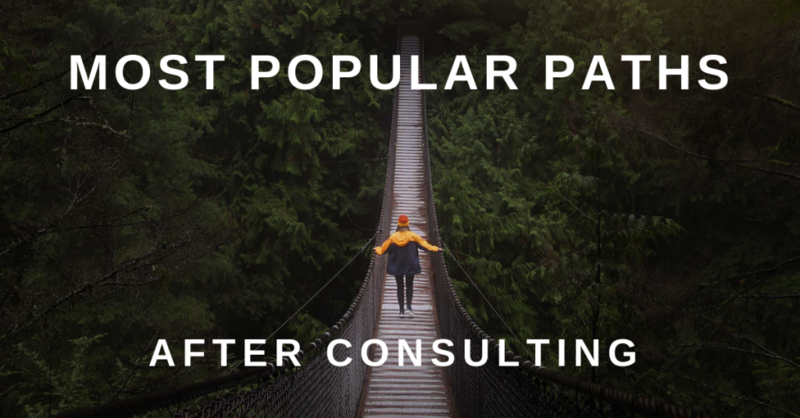 After working for years in a consulting firm, even die-hard consultants, the ones who love every aspect of consultancy, might need a bit of a breather. They might also simply wish to be the commanders of their fortune. This is, indeed, a prime reason why a lot of them decide to open their own boutique consulting firms or work as freelancers. Many consultants develop very strong financial skills during their years in consultancy. These skills prepare them very well and make them very sought after, by financially-minded institutions like private equity or venture capital firms. Consultants’ financial skills, matched with their strong strategic outlook and consulting ‘toolbox’, make these bright individuals the perfect candidates for PE & VC funds. If you were interested in this article take a look at our most recent article related to leaving consulting.